St. Andrew's Missal lists a little known Virgin and Martyr, St. Emerentiana, on January 23, two days after the feast of St. Agnes. Nothing seems to be more appropriate: Emerentiana followed Agnes in her life as well as in her death, so she should also follow Agnes in the Liturgical Calendar. It is not surprising to find another Virgin Martyr in the Christmas cycle, which includes so many other admirable virgin saints, e.g., St. John the Apostle, St. Paul the Hermit and St. Antony the Abbot. A foster-sister of St. Agnes, the virgin Emerentiana, while still a catechumen, shed tears on the tomb of her friend who had just been martyred. 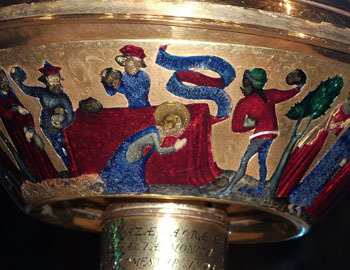 Some Pagans mocked at her grief. She, full of the divine virtue of which Jesus is the source, reproached the idolaters with their cruelty towards Agnes, and they in their fury stoned her on that very tomb. Baptized in her own blood, she went to join forever her Spouse and her sister (about the year 304). In the account of the martyrdom of St. Emerentiana we find confirmed the Church's constant teaching on the Baptism of Blood. Raised to the altar and included in the Liturgical Calendar, this Roman girl, daughter of a slave of the wealthy noble family of Agnes, was still a catechumen and not yet baptized when Agnes was martyred. 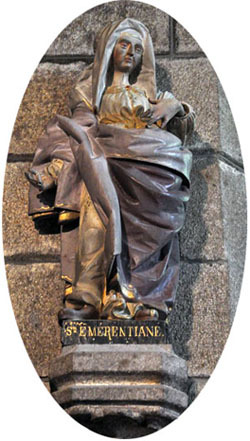 Emerentiana's mother was the wet nurse and nanny of St. Agnes. The influence of the Christian patrician parents and the example of their virtuous daughter Agnes had a profound effect on the servant and her daughter Emerentiana. A slave by birth but a milk-sibling, Emerentiana was inspired by her mistress Agnes who was teaching her the holy Faith so that she might be baptized a Christian. 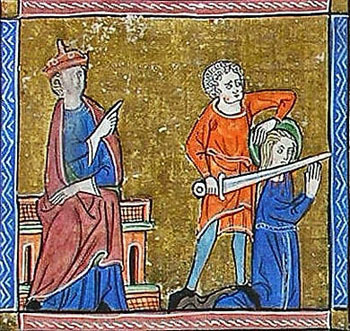 Her course of study was abruptly ended with the glorious death of Agnes. Several days after Agnes was publicly martyred, which Emerentiana probably witnessed, she went to the tomb to pray. Mocked by a group of pagans who saw her there grieving, she courageously defended her mistress. This brave rebuttal raised the fury of a group of pagans and they stoned Emerentiana to death on the very tomb of her dear mistress Agnes. The tomb of the teacher became the throne of martyrdom for the disciple. It is a beautiful scene. Also it is a scene that confirms what has been believed and taught since the first centuries of the Church: that martyrdom is equivalent to baptism for those not yet baptized. It is Catholic doctrine that Baptism of Blood blots out Original Sin and all actual sin, along with the punishment due to it. Indulgéntiam nobis, quaesumus, Dómine, beáta Emerentiána Virgo et Martyr implóret: quae tibi grata semper éxistitit, et merito castitatis, et tuae professione virtútis. Thus, did St. Emerentiana join that privileged group of martyr saints who were never baptized with water but gave their blood for Christ such as the Holy Innocents massacred by Herod and one of the guards who witnessed the martyrdom of the 40 Saints of Sebaste. The great St Ambrose left no less than four treatises dedicated to virginity, De virginibus, De virginitate, De institutione virginis, and Exhortatio virginitatis, besides his treatise addressed to widows, De viduis, in which some of his teachings on virginity and marriage are reaffirmed. His teaching is characterized and distinguished by the connection he makes between martyrdom and virginity, and the great praise he makes of celibacy. The two virgins, St. Agnes and St. Emerentiana, who both won the crown of martyrdom in the year 304 under the Diocletian persecution, remain linked in life and death. The body of St. Agnes was buried by her parents in a private cemetery they owned along the Nomentan Way, and the body of the catechumen Emerentiana rightly was interred there also. This cemetery grew rapidly in fame, with many miracles taking place at it. 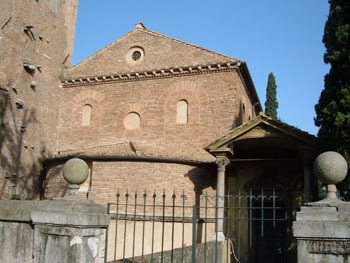 During the reign of Constantine, through the efforts of his daughter Constantina who received a miracle of healing through the intercession of St. Agnes, a basilica was erected over the grave of that Virgin Martyr, which was later remodeled by Pope Honorius (625-638), and has since remained unaltered. 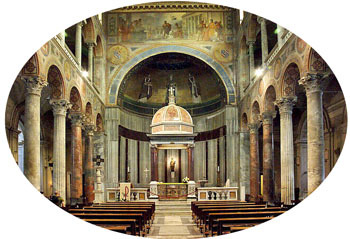 In this Basilica under the main altar is the tomb of both St. Agnes and her disciple and friend St. Emerentiana. Blessed are the undefiled in the way: who walk in the law of the Lord.